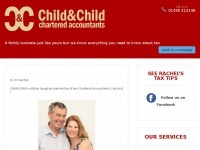 Child&Child Chartered Accountants are a Father and Daughter partnership offering financial advice and services to individuals, sole traders, partnerships, start-ups and companies looking for chartered accountants Monmouth. Their passion is helping families and family businesses like their own with their finances, as well as supporting local individuals and businesses. A profile of Childandchild.biz was found on the social network Facebook. The web server used by Childandchild.biz is located in Chantilly, USA and is run by Ddudamobile.com. There are many websites run by this web server. The operator uses this server for many hosting clients. In total there are at least 227 websites on this server. The language of these websites is mostly english. A Nginx server hosts the websites of Childandchild.biz. The website uses the latest markup standard HTML 5. The website does not specify details about the inclusion of its content in search engines. For this reason the content will be included by search engines.